Finding new ways to increase economic development opportunities and impact energy policies were two of the many topics at the National Extension Energy Summit in Seattle. 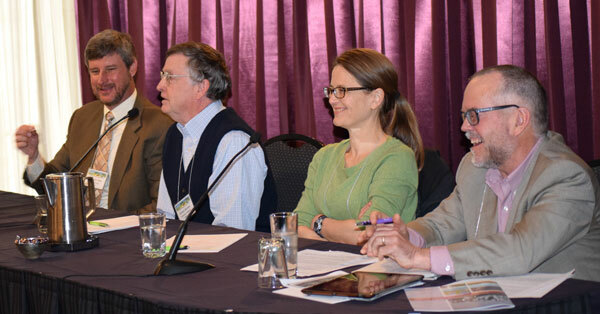 Participants from 31 states and the District of Columbia shared their vast knowledge of regional energy issues, climate change, and outreach efforts at the April 7 – 10 conference in Seattle sponsored by Washington State University Extension and Advanced Hardwood Biofuels Northwest (AHB). 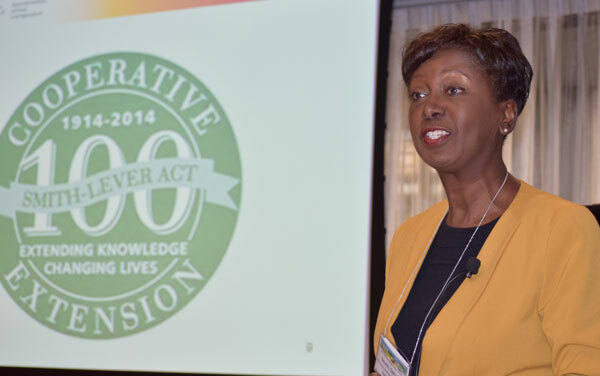 Beverly Samuel from USDA NIFA encourages Extension teams to reach wide audiences with energy efficiency education. Other keynote speakers included Heidi VanGenderen, US Department of Energy; KC Golden, Climate Solutions; USDA Program Leader Bill Goldner; and Wendy Gerlitz, Policy Director of the NW Energy Coalition. Panelists Chris Jones from University of Arizona, Richard Gammon from University of Washington, Lara Whitely Binder from Climate Impacts Group — University of Washington, and Ross Mcfarlane from Climate Solutions. Over two dozen individual presenters shared information in tracks focused on interactive energy discussions, communicating energy through Extension, and energy from farms and forests. Topics included farm and small business clean energy projects, creating sustainable community energy plans through citizen engagement, and energy literacy for youth. Bioenergy components examined small scale pellet production from forest residuals, mobile pyrolysis, and Extension’s role in building support for wood energy policy education. Representatives from each of the seven Agriculture and Food Research Initiative Coordinated Agricultural Projects shared their experience of working with biofuels to produce sustainable transportation fuels. In addition to AHB, project work from BANR, CENUSA, IBSS, NARA, NEWBio, and subi was presented to nearly 100 attendees. Conference sponsors included USDA NIFA, GreenWood Resources, and Washington State University Extension. Started in 2013, the National Extension Energy Summit is a bi-annual event focused on public and land-grant universities and their role in finding energy solutions to meet the nation’s energy needs.